I realize that it isn't realistic (or beneficial to students) to only rely on using food, or edibles, to get students to comply with directions and complete work. However, I also see the importance of using edibles initially with certain students. 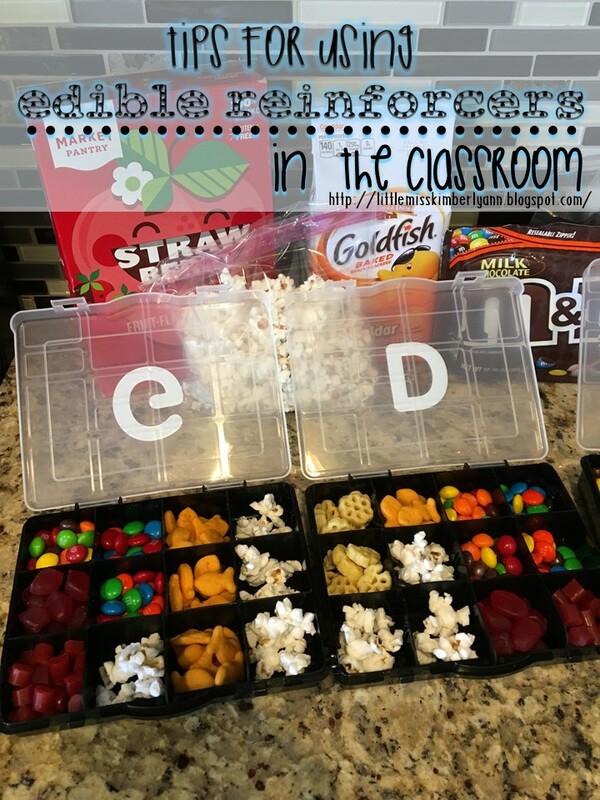 Edibles are meaningful reinforcers for young students who have a limited range of reinforcers (for example, the student doesn't have a variety of toys/ activities that are reinforcing to him) and for students who have severe behaviors. It's important to use edible reinforcers strategically so that edibles aren't the ONLY reinforcer you use. You don't want kiddos to get bored of snacks or flavors that you're using as reinforcers. A way to avoid this is to vary your snacks and to alternate between a salty edible and a sweet edible. You can also alternate between an edible and a small sip of juice or milk. Alternating snacks will avoid satiation (e.g. The kiddo eats so many Skittles, that Skittles are no longer reinforcing; so Skittles temporarily decrease the kiddo's learning/ performance). A side note/ tip around drinks as reinforcers: it's a good idea to provide students with a cup and then you can pour only a small sip of juice/ milk into the cup to avoid them slurping down an entire juice/ milk box in 3 seconds. This tip is pretty simple... Kids are different and they won't all enjoy the same edibles (shocker!). It's important to identify what edibles are reinforcing to kiddos to ensure that they're actually motivated to work/ comply with requests. 1) A super easy way is to just ask the kiddo (if he or she is verbal) or ask his/her parents or care givers what the kiddo's favorite snacks are. Parents can normally easily identify what snacks their kiddo loves. 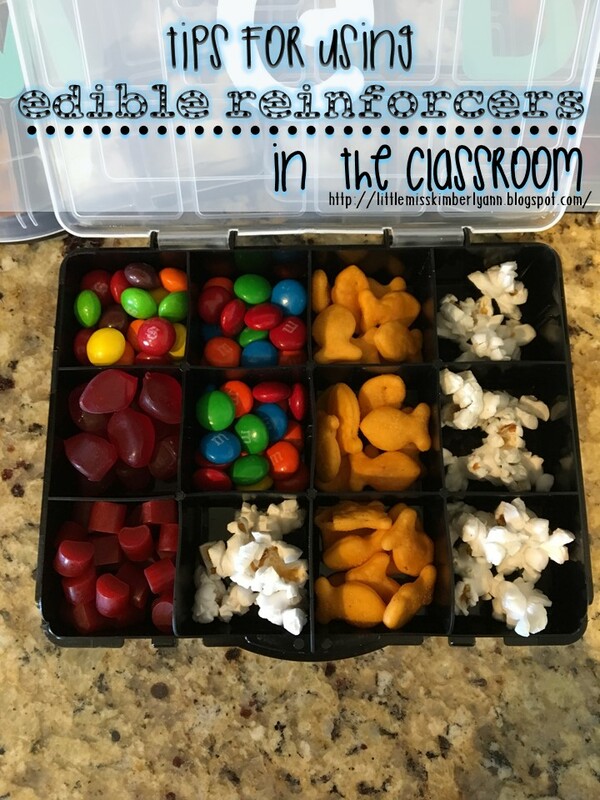 2) It can also be helpful to identify edibles that are reinforcing by observing the kiddo... Watch the kiddo in the lunch room- what snack/food does the student eat first from his lunch? If you're in the home, watch the student in the kitchen and see what foods he gravitates towards. 3) Once you have an idea of what edibles are reinforcing to the kiddo, test it out! You're working with a kiddo named Billy. Billy's mom says he loves M&Ms, Cheetos and fruit snacks and that he hates all fruits and vegetables. When you observed Billy in the lunch room, you notice that he ate the fruit snacks in his lunch box first, then he ate the M&Ms and ate Cheetos last; he never ate his apple, gold fish or popcorn. If you want to test out the reinforcers with Billy, you could place a variety of edibles in front of him and just watch what he does and doesn't eat. For example, if you put a fruit snack, M&M, gold fish and piece of popcorn in front of him at the same time and he only eats the fruit snack and M&M, those are probably reinforcing to him, while the gold fish and popcorn might not be appropriate reinforcers for Billy. To try to identify what edibles are most reinforcing to Billy, you can put numerous items that Billy finds reinforcing (M&Ms, fruit snacks and Cheetos) on the table at the same time and see what snack he goes for first, second and last. Although you should remember that this isn't the only reliable way to know what's most reinforcing to Billy, because if Billy ate an entire bag of Cheetos before school that day, he might go for the M&M first, but if Billy hasn't had Cheetos in 3 days, he might go for the Cheetos first. With that said, it's important to play with reinforcers regularly to see what is reinforcing to the kiddo on that specific day. If you're working with Billy and he doesn't seem into fruit snacks that day, just skip using fruit snacks during work that day. 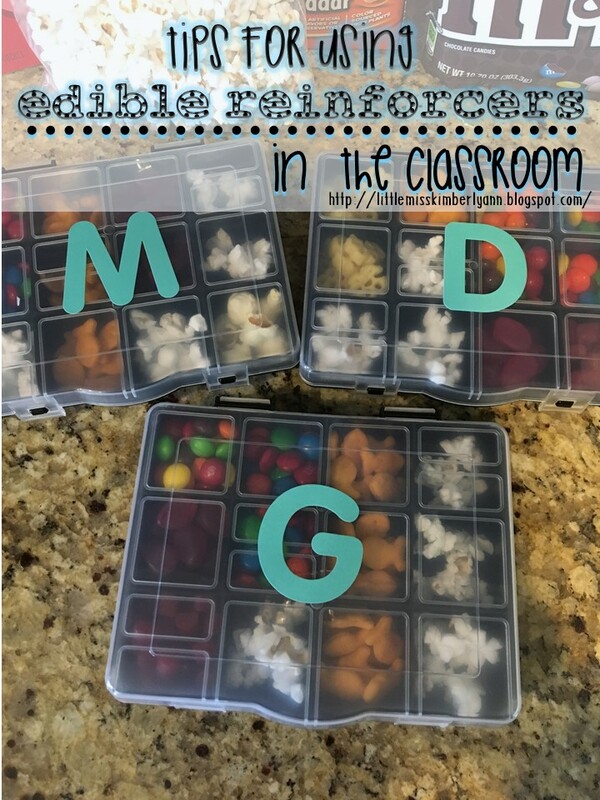 Once you know what each kiddo likes, you can make little boxes to store and organize edible reinforcers. These little boxes are really convenient because whatever staff member is working with the specific student can just grab the box and go. I found the below boxes are the Dollar Tree, but Micheal's also has cheap options and a variety of sizes! Individualized edible reinforcer boxes with student initials on the front. -Cut edibles in half (when possible) and use small items! I wouldn't consider myself a health nut by any means, but I do think it's important to try to do our best to keep our kiddos healthy and to not indulge them in too much sugar. I cut any edibles I can in half try to reduce the calorie and sugar intake of the kiddos I'm working with and I only use small edibles as reinfocers. A Twizzlers nibs cut in half. It's very important to pair the delivery of an edible with verbal praise. If you pair the edible with a verbal praise, it will help you to fade the edible so that down the road, students can simply be reinforced by your verbal praise! -Billy is sitting with the group for circle time (the desired behavior), as you're handing Billy a Cheeto you could say, "Wow! Fabulous sitting, Billy! Have a Cheeto!" -You want Billy to match a green card to a green plate (behavior), when Billy correctly matches the card you could say, "Right! You matched green, well done!" while handing Billy a fruit snack at the same time. It's crucial to fade the use of edibles over time! It's not realistic to think that a kiddo can get an M&M or Skittle for every single correct response in school for the rest of his/her academic career. Edibles shouldn't be used as a crutch for staff and students, but as a way to get students to initially start working and to see other things (like toys/ activities and verbal praise) as reinforcing. -Billy is working on sitting in his chair during circle time. At first, you might give Billy an edible and verbal praise every 30 seconds for sitting. Once he's mastered this, you could fade the edible to every 60 seconds, then 90 seconds, etc. As Billy masters sitting in his chair, you would continue to increase the time Billy has to sit in his chair before he earns an edible. -When Billy is working on matching colors, you might initially give Billy an edible and verbal praise after every single correct response. As Billy starts mastering matching colors/complying with your requests, you might start giving Billy the edible only after every 2 or 3 correct responses and continuing to increase the number of correct responses needed to earn an edible. Note: As I'm fading the edibles, I continue to provide verbal praise for correct responses even when I'm not giving an edible. 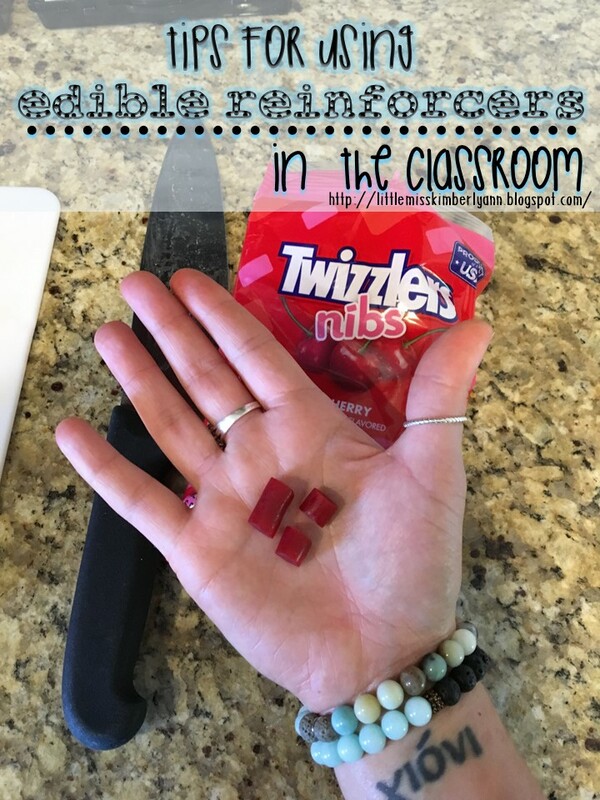 Please, please, please feel free to share any other ideas/tips you have around using edibles in the classroom or ask any questions you have! Im so glad to read this! Ive been using edibles with a student during a reading mastery lesson. He is incredibly motivated by food. He loves to pick "hoyster" crackers. I had been wondering what other peoples thoughts on this were. When practicing sounds he always responded "d" to every letter without looking. I've got both salty and sweet and he likes to pick what he works for. He has imoroved excellently. I did always want to make sure I wasn't feeding him a whole meal and made it something small. So we end up with a snack and not lunch. I like your idea of the little tackle boxes!